Believe it or not, I love packing. It accounts for 50% of the excitement I have for traveling. Over the years, I have created a plan which ensures I am always prepared. (Although I have realized I under pack for myself. I am always one or two outfits short for the trip!). I like to pack in pouches, as it helps me stay organized. Also, makes it easier to find things. One of my key tools in packing for longer duration is the vacuum bags (like this). I also carry a few dust bags, for shoes, dirty laundry, etc. You can checking out my packing list here. 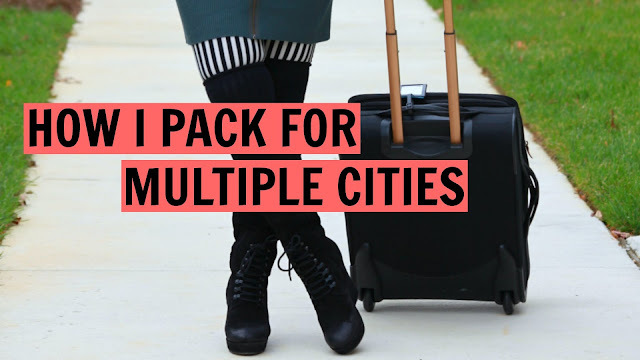 Hit PLAY to find out how I pack when traveling to two or more cities. P.S. This is how I had packed for my trip to Spain & Morocco last winter. I always used to be an over packer but now my motto is that less is more! Hear! Hear. Less, indeed is more. Wow!! I absolutely love that you love those things too that I love. (Too much love, doesn't hurt!!) Efficiency in packing is indeed a skill and you have mastered it so well. Kudos to you! I hate packing, but I love traveling. So, I loves this video, much like your blog 😊 currently traveling to Phoenix then Los Angeles and finally Seattle before going back to Texas. It was crazy packing for all the cities lol. But I've got your tips for my next trip. Keep posting! !